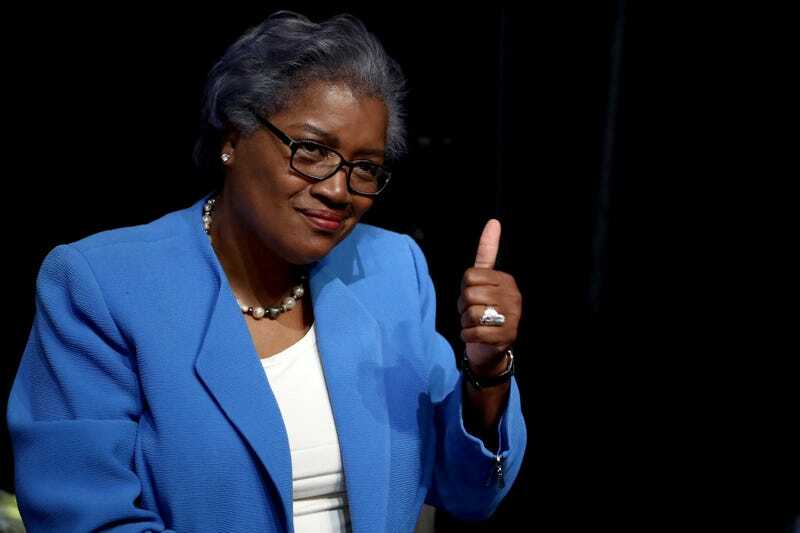 Donna Brazile gives a thumbs-up during the first day of the Democratic National Convention at the Wells Fargo Center in Philadelphia on July 25, 2016. Signs point to TV One, the African American-owned cable television network that partnered with CNN to present a March presidential town hall with the Democratic candidates, as the source of the leak to Democratic strategist Donna Brazile about at least one question to be asked during the town hall, two media reporters told readers on Monday. CNN said Monday that it had severed ties with Brazile after hacked emails from WikiLeaks showed that she shared questions in advance with friends on Hillary Clinton’s campaign. "Ms. Brazile, a veteran political analyst for the network, was already on leave from CNN since becoming interim chairwoman of the Democratic National Committee. On Monday, CNN said it had accepted her formal resignation on Oct. 14," Michael M. Grynbaum reported for the New York Times. Brazile "says she resigned rather than get in an extended dispute with CNN over her role at the network," David Folkenflik reported for NPR. "How can CNN straight-facedly make the claim that the network never gave Brazile access to questions? It’s actually not an outlandish claim: In the case of the town-hall event, she got the question from a contact at [TV One]. . . ."
Hadas Gold wrote for Politico, "Now the hacked emails show that Brazile, on two separate instances, tipped off the Clinton campaign ahead of time on questions that might come her way at CNN events. "In the first instance, ahead of a March 13 CNN town hall, it appears that guest-moderator Roland Martin from TV One may have shared his contributions to the questions with Brazile. "In an email the day before the town hall to senior Clinton staffers, Brazile wrote: 'From time to time I get the questions in advance' and included the text of a question about the death penalty. An email later obtained by POLITICO showed that the text of the question Brazile sent to the Clinton campaign was identical to a proposed question Martin had offered CNN. (A similar, though not identical question, was ultimately posed to Clinton at the town hall). "The Martin connection was seemingly cemented on Monday when WikiLeaks published more of that thread, featuring a newly released reply in which Brazile promises to send additional questions. "Martin initially denied sharing his questions with anyone, but later said his executive producer and team at TV One had the questions in order to pass them on to the CNN team. Once POLITICO obtained further emails, Martin said he didn’t believe he consulted with Brazile about the questions. Martin did not return a request for comment on Monday. . . ."
TV One told Journal-isms Monday that it was preparing a statement. On Tuesday, it issued a response that did not address whether its employees provided the questions to Brazile. It said, "News One Now Host and Managing Editor Roland S. Martin is one of the most trusted journalistic voices in Black America. His audience, whether on TV, radio or social media, knows that Roland will ask the tough questions they care about. As previously stated, Roland researched his questions as he always does and shared them with TV One and CNN. No personnel from TV One shared questions or information with Secretary Hillary Clinton’s campaign. Since the email was neither from nor to a TV One employee, we do not have any direct knowledge of it. What we do know is no matter who is elected President, Roland Martin will demand accountability from them on matters of importance to Black America. "Regarding the most recent story, we deem it inappropriate to comment since the issue is related to an event hosted by CNN, in which we had no connection." Asked whether the reference to the Clinton campaign included Brazile, spokeswoman Tosha Whitten-Griggs said by email, "No further comment will be provided on this topic. TV One created a podcast of the March town hall meeting with the Democratic presidential candidates, co-hosted by Jake Tapper and Roland Martin. Why Are Political Operatives on Cable as Pundits? CNN’s decision to fire Donna Brazile for her ties to the Clinton campaign rang hypocritical to many who noted that Corey Lewandowski, former campaign manager for Donald Trump, remains on the network’s payroll, Elizabeth Preza wrote Monday for Raw Story. "CNN has faced significant criticism since hiring Lewandowski in June, after news broke that the former Trump campaign manager continued to receive severance pay from the Trump campaign well into his time as a CNN contributor. Earlier this month, [Lewandowski] was even spotted low-key traveling with the Trump campaign, going to great lengths to conceal his identity from fellow members of the media. . . ."
Preza cited responses from Twitter users, but many in the media have complained in other venues about the use of political operatives as analysts on the cable news networks. Dean Baquet, executive editor of the New York Times, told the Financial Times on Friday that CNN had been wrong to hire Lewandowski as a commentator and was in danger of damaging both itself and democracy. “I’m sorry, that is outrageous. I cannot fathom that,” he said of Mr Lewandowski’s onscreen role, describing him as “a political shill,” John Gapper reported Friday for the Financial Times. After the final presidential debate on Oct. 19, David Uberti wrote the next day for Columbia Journalism Review, "Trump’s divorce from truth on the trail has been buttressed by talking heads relaying his misinformation on cable. This divide is particularly striking at down-the-middle CNN, which has built out a first-rate team of political reporters that aggressively challenges the veracity of these very claims. . . . CNN contributors are introducing false information into the network’s programs." The Washington Post's Erik Wemple agreed on Monday in reporting on the Brazile affair. CNN "still needs to account for its addiction to political types crowding its payroll and crowding out honesty and journalism on its unwieldy panel discussions in its campaign 2016 coverage. "The problem is bipartisan. On one side, there are Lewandowski and Trump surrogates, who are paid to weigh down broadcasts with dumb and sometimes inaccurate commentary; on the other side are Clintonites. "As this blog reported over the summer, a key Clintonista — paid CNN political commentator Maria Cardona — pre-checked a draft of a CNN op-ed with the DNC before publishing it; Brazile did what she did; and who knows what other mission-shaming chicanery came off the keyboards of conflicted CNN commentators? . . ."
Black women are more optimistic about the power of their vote than their white counterparts and are almost twice as likely to believe that # (hashtag) campaigns are effective at influencing public policy compared to white women, according to a survey released Monday by the Delta Research and Educational Foundation, a nonprofit organization established in 1967 by Delta Sigma Theta Sorority, Inc.
At the same time, the project called attention to "the potential for impactful messaging for civic engagement utilizing hashtag campaigns" and found that "a high percentage of apathetic low income voters believe their vote really does not matter" and "there is a low percentage of African American women who donate to political campaigns. . . ."
The foundation is dedicated to charitable and educational programming. Rekha Basu, Des Moines Register: Why is Trump leading with whites with no college degree? David A. Fahrenthold, Washington Post: Trump boasts about his philanthropy. But his giving falls short of his words. "Imagine if, during the Jim Crow era, a newspaper offered advertisers the option of placing ads only in copies that went to white readers," Julia Angwin and Terry Parris Jr. reported Friday for ProPublica. "That’s basically what Facebook is doing nowadays. "The ubiquitous social network not only allows advertisers to target users by their interests or background, it also gives advertisers the ability to exclude specific groups it calls 'Ethnic Affinities.' Ads that exclude people based on race, gender and other sensitive factors are prohibited by federal law in housing and employment. Angwin and Parris also wrote, "Facebook says its policies prohibit advertisers from using the targeting options for discrimination, harassment, disparagement or predatory advertising practices. “ 'We take a strong stand against advertisers misusing our platform: Our policies prohibit using our targeting options to discriminate, and they require compliance with the law,' said Steve Satterfield, privacy and public policy manager at Facebook. 'We take prompt enforcement action when we determine that ads violate our policies.' . . ."
"On the same day seven defendants celebrated their acquittal in the armed takeover of a federal wildlife refuge in Oregon, law enforcement officers dressed in riot gear and firing bean bag rounds arrested nearly 150 oil pipeline protesters camped out in North Dakota," Gillian Flaccus reported Sunday for the Associated Press. "The sudden developments in the two protests drew an unsettling contrast for some between the treatment of mostly Native American citizens at an encampment near the Standing Rock Sioux Reservation and the heavily armed occupiers who held the federal government at bay for weeks in the remote Malheur National Wildlife Refuge. “ 'How is it that people who were seen on national media with guns having a standoff with police officials were acquitted … and we’re being treated like we’re terrorists?' said Cody Hall, a member of the Cheyenne River Sioux Tribe in South Dakota and a spokesman for the pipeline protesters. . . ."
However, Kirk Johnson, Julie Turkewitz and Richard Pérez-Peña reported Friday for the New York Times, "Though the exact reasoning of the jurors, who came from across Oregon and were never identified by name in court, remains unknown, most onlookers blamed prosecutorial overreach — that the government stretched its case too far to fit the events at the refuge — or stumbles in the presentation of evidence. . . ."
Flaccus wrote, "Ammon and Ryan Bundy, neither native to Oregon, seized the refuge in January to a protest the imprisonment of two ranchers convicted of setting fires on public land. More than two dozen others eventually joined the 41-day occupation, which grew into demands for the U.S. government to turn over public lands to local control. "On Thursday, jurors acquitted the brothers and five others on felony charges that included conspiracy and possession of a gun in a federal facility. . . ."
Lincoln Anthony Blades, Ebony: If the Bundys Were Black Would They Be Free? Steve Russell, Indian Country Today Media Network: Malheur v. DAPL: Jury Nullification or Prosecutor Overreach? "While elite media wait for the resistance to the Dakota Access Pipeline to go away so they can return to presenting their own chin-stroking as what it means to take climate change seriously, independent media continue to fill the void with actual coverage," Janine Jackson reported Saturday for Fairness & Accuracy In Reporting. "One place you can go to find reporting is The Intercept (10/25/16), where journalist Jihan Hafiz filed a video report from North Dakota, where the Standing Rock Sioux and their allies continue their stand against the sacred site-trampling, water supply-threatening project. "As the demonstrators attempted to leave, the police began beating and detaining them. Several Native American women leading the march were targeted, dragged out of the crowd and arrested. One man was body-slammed to the ground, while another woman broke her ankle running from the police. The military and police trucks followed the protesters, as nearly a hundred officers corralled them into a circle. Among the arrested were journalists — including Hafiz — a pregnant 17-year-old and a 78-year-old woman. "Once jailed, Hafiz and others were refused phone calls and received no food or water for eight hours. Women were strip-searched, two women fainted from low blood sugar and another had her medication taken away. "That crime, of course, would be journalism. And it’s hard to believe law enforcement would feel so cavalier about treating it that way if more reporters were actually committing it. . . ."
Regina Garcia Cano, Associated Press: Money pours in for anti-pipeline protest, but will it last? "If you’re not counted, you don’t count," Sarah Eppler-Epstein wrote Oct. 17 for the Urban Institute, republished Thursday by Latino Rebels. "In this era of metrics and analytics, most people understand the importance of accurate statistics on race and policing. Though public data on race in the criminal justice system is far from complete, most states at least report the number of white and black/African American people in their prison and arrest records — numbers that play a key role in informing today’s movements, like Black Lives Matter. "When it comes to ethnicity, though, there are many holes. "Latinos are a fast-growing portion of both the US population (nearly one in five Americans are Latino) and the correctional population, but gaps in states’ criminal justice system data mean that we don’t know how many Latinos are in prison, on probation, or arrested. . . ."
"Journalists rightly complain when receiving heavily redacted government documents where thick black lines obscure critical information," Tim Gallagher wrote Oct. 20 in his "Business of News" column for Editor & Publisher. "The average newspaper reader would fairly have the same reaction with how American newspapers cover religion and issues based on faith. It’s as if we borrowed that government censor’s black pen for drawing thick lines right through any reporting that dares to invoke God or traditional religious faith. "Terry Mattingly [believes] it is one of several reasons we are losing readership — we choose to ignore an issue our readers find important. Mattingly has been a splendid writer on matters of faith for more than 30 years. Find him at Tmatt.net. "The divide between journalists and average Americans on faith matters has been documented for decades. Numbers vary but Americans consider themselves faithful and attend services at a rate of four to five times the rate of journalists. . . ."
This week — Oct. 31 to Nov. 4 — is Media Literacy Week, created "to highlight the power of media literacy education and its essential role in education today." [PDF] The week is sponsored by Trend Micro and hosted by the National Association for Media Literacy Education. Willie T. Smith, a sportswriter at the Greenville (S.C.) News for 32 years, has left the paper, Sports Editor Jim Rice confirmed on Monday. Smith told Journal-isms he was laid off in Gannett Co. cutbacks. He told Facebook followers on Wednesday, "I don't know what is next for me but, in the meantime, I will continue to comment on things that interest me. That mostly means USC (but not exclusively) since that's what I've covered most recently. Gamecock fans are suffering a bit now, but better times are coming. . . ."
"The WGA East has scored another victory in its ongoing campaign to organize the editorial staffs of Internet news sites," David Robb reported Wednesday for Deadline Hollywood, referring to the Writers Guild of America East. "On Wednesday, staffers at The Root, a daily news and analysis site focusing on the African-American experience, asked their bosses to recognize the guild voluntarily as their bargaining representative. . . ."
"Latina journalist Maria Hinojosa schooled Donald Trump adviser Steve Cortes on Saturday morning regarding the use of the term 'illegals' on MSNBC's AM Joy," Tom McKay reported Saturday for mic.com. "After Cortes said it is 'more unfair for legal immigrants to allow for illegals to hop in front of them and cheat the system,' Hinojosa retorted: '[Illegal] is not a noun … what you can do is say an immigrant living illegally or an immigrant living without papers or without documents in this country. But what you cannot do is to label the person illegal.' . . ." Hinojosa said she learned that from Elie Wiesel, who survived the Holocaust. "The Diversity Toolkit: A video and printed workbook to help broadcast and digital news organizations seeking to include more diverse voices on staff and in news content," is now available in PDF form, the Radio Television Digital News Foundation announced Thursday. "You are welcome to download it, print it and use it to develop a diversity workshop for your organization. The toolkit workbook and its accompanying video companion piece is included on our Diversity Toolkit page and is also available on the RTDNF YouTube channel. . . ."
Dr. Patrick Soon-Shiong, the Los Angeles billionaire and Tronc investor, "has been in 'advanced talks' to take an ownership interest in his hometown Los Angeles Times, or an interest in the larger Gannett that is a reflection of his investment in the Times," Ken Doctor reported Friday for Politico. ". . . Soon-Shiong’s role in the almost-completed acquisition is unclear. What is clear now: his continuing interest — and his money, backed by a net worth of at least $10 billion — may now drive the next possible deal. . . ." Though Gannett’s deal to buy Tronc, the former Tribune Publishing, unwound in real time Thursday, "Broken deals mean one thing: opportunity," Doctor wrote. "A recent academic survey co-authored by a Native Oklahoman shows that there may be more First Amendment protections in Indian Country than originally thought," Lenzy Khrehbiel-Burton reported Friday for Native Times. "In late September as part of the Native American Journalists Association’s annual national convention, researcher and former journalist Kevin Kemper unveiled research showing more than 400 tribes have some form of codified First Amendment protection. . . ."
"A memo shared with BuzzFeed News details a proposal by a conservative-leaning nonprofit offering to produce and publish anti-Clinton articles as news stories in the black press before the election in exchange for a cash donation," Darren Sands reported Wednesday for BuzzFeed News. "BuzzFeed News reported Saturday that, according to sources familiar with the conversations, the American Media Institute had approached conservative donors to fund right-leaning stories presented as news on a newswire that supplies content to African-American newspapers. American Media Institute founder Richard Miniter heatedly objected to the story broadly. . . ."
"Though people all across the Internet are eulogizing Vine for its 'mirthful' videos and for the gaping six-second hole it'll leave in our collective hearts, this is also a particular loss for young people of color. Vine is home to a distinctly younger — and browner and blacker — user base," Kat Chow wrote Friday for NPR's "Code Switch." Twitter announced last week that it is discontinuing the mobile app. In Britain, "The only journalist whose conviction for payments to public officials under Operation Elveden was still standing has had his guilty verdict overturned by the court of appeal," Jasper Jackson reported Thursday for the Guardian. "Sun crime reporter Anthony France was found guilty in May last year of aiding and abetting a police officer working for a counter-terrorism command squad to commit misconduct in a public office. He was sentenced to 18 months’ prison, suspended for two years, and ordered to carry out 200 hours of community service. . . ."
"In the past fifteen years, families in the United States have adopted more than 200.000 children from other countries, and over 20.000 from South Korea," according to the introduction to an Oct. 14 podcast from koreaandtheworld.org. "The origins of America’s status as an adoption nation lie in the years after the Second World War and oftentimes in humanitarian intentions. Yet, adoptions are also linked to problematic phenomena, from racial preferences on the side of adopters to economic interests in the adoptees’ home countries. . . ." Catherine Ceniza Choy, professor of Asian American and Asian Diaspora Studies at UC Berkeley, was interviewed. Wesley Morris, critic at large for the New York Times Magazine, broke a taboo of his own in Sunday's issue of the magazine with a 6,200-word piece on black men's genitalia headlined, "LAST TABOO: Why Pop Culture Just Can’t Deal With Black Male Sexuality." April Ryan, chief of American Urban Radio Networks' Washington bureau — the only African American broadcast bureau in the White House — will celebrate two decades on the presidential beat in January, which also marks the swearing-in of the 45th president, Brittany Britto wrote Friday in a profile of Ryan in the Baltimore Sun. "On Thursday, I reported that Baltimore Mayor Stephanie Rawlings-Blake was going to be part of the election-night coverage on ABC. She will be there as one of several analysts," David Zurawik reported Saturday for the Baltimore Sun. "Now for the opinion part: ABC News hiring Rawlings-Blake even for one night after she banned a local reporter from her weekly press briefing is as wrong in its own way as CNN hiring former Trump campaign manager Corey Lewandowski as an analyst. . . ."
Not everyone at NBC News got the memo. After other major news organizations acknowledged last summer that the shooting at an Orlando nightclub in June, in which a gunman killed 49 people, was not "the deadliest mass shooting in U.S. history," reporter Gabe Gutierrez continued to refer to it that way on Monday's "NBC Nightly News." Anchor Lester Holt, introducing the piece, accurately called it "the largest mass shooting in modern U.S. history." The Associated Press, correcting itself in June, reported, "In truth, America has seen even bigger massacres, some involving hundreds of men, women and children." Many targeted Native Americans and African Americans in the 19th and early 20th centuries. Don Lemon's one-hour “CNN Tonight” "now takes up two, and on some evenings, he may stay on the air until 1 a.m. or later," Brian Steinberg reported Wednesday for Variety. Post-election, “I would like it to be a little bit looser. I would love it to be like HBO. I would love to be able to say those things you never say on basic cable. I would love to be able to have those conversations the way Bill Maher does,” Lemon told Steinberg. "The Turkish authorities detained the editor and several prominent writers of one of the country’s few remaining opposition newspapers on Monday, a day after the government dismissed 10,000 civil servants suspected of links to a failed coup in July," Ceylan Yeginsu reported Monday for the New York Times. "Murat Sabuncu, the editor in chief of Cumhuriyet, Turkey’s oldest secularist newspaper, and at least 12 other executives and journalists from the daily were detained during early-morning police raids. . . ."